All 3 telcos (Singtel, Starhub, M1) have announced that they will sell the iPhone 5 beginning Friday, September 21. Alongside, they have also announced their new 4G LTE plans. Singtel and M1 have announced the details of their price plans for the iPhone 5, and the pricing is as follows. The price comparison between M1 and Singtel is shown below and it looks like M1 is aggressive. The basic model iPhone 5 16GB is great value from M1 with the Value+ plan a significant 48 dollars cheaper than Singtel. For the prices from Starhub, only the iPhone 5 16GB is competitive. The rest of the prices are ridiculously more expensive than the others. We are expecting the price for iPhone 5 (16GB) to be at S$498 with a basic 4G plan, i.e. the same launch price as the iPhone 4S.SingTel today announced it will offer iPhone 5, the thinnest and lightest iPhone ever, to customers in Singapore beginning Friday, September 21. Follow their website here to pre-order Singtel iPhone 5.Likewise for Starhub pre-order, their website here. Starhub has updated the site to allow for pre-registration.M1 pre-order website here and they have revamped their iPhone price plans and its actually cheaper compared to normal. 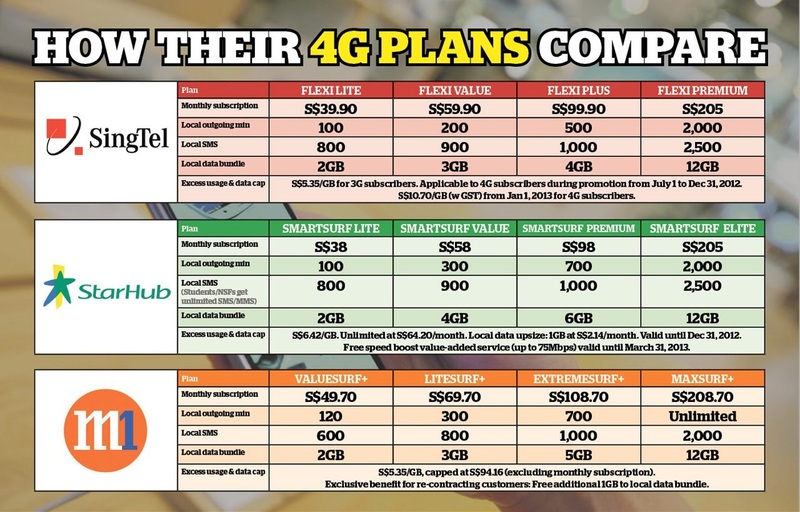 It is not a 4G plan though, just a normal 3G plan and if you add the 4G VAS, it becomes more expensive than Singtel. Don’t forget, you can also buy from Apple Store too. The launch price is S$948 for the 16gb model and likely 1088 for the 32gb and 1238 for the 64gb. Same as the previous models. Past experience shows that you can pre-order from them too and they will ship out either on the 21st or 22 of September. But stocks are expected to be limited so do it fast. Hi, LTE for starhub actually costs $38 + $10.70, as the Super Boost VAS is actually what separates normal 3G plans for 4G plans. The $38 now is just a promotion, and not the actual cost. The plan is much like M1, where LTE is actually a VAS. Hi Pip! Yes you are right. Starhub actually has a VAS component but one thing that our telcos love to do, is to price match… so we are hoping that starhub will extend the free VAS for some time to keep their prices competitive.. but we are hoping anyway.. thanks for pointing it out, more impetus to transfer to Singtel actually.